Who doesn't love a freebie? Especially when you are doing Stitch from Stash it's a great way to try a new designer, a new technique or just stitch a small. Back in the olden days before t'internet freebies were sent to the needlework shops who gave them out to their customers, sometimes with the purchase of a specific item. Just Nan did this a lot with her small designs. You bought the charm and got a free chart. As the internet grew in popularity designers realised they could have free designs on their websites which would bring customers direct to them. The hope was that while you were there you would be tempted by a chart for sale. So freebies serve a purpose - they are there to increase traffic and sales. Which is why I loathe Pinterest so much. It does neither. It's rare that the link goes to the original designer. When I am trying to find genuine freebies via Google, I used to get a page of links to websites and blogs, now I get a page of Pinterest. Many of which are not even free charts. So if you are sharing a freebie - please link to the original website or blog. Don't show the chart. Don't link to Pinterest. Support our designers! This was given to me by my local needlework shop back in 1998. I then discovered that all the previous years were available online. There are 20 altogether and I have stitched 12 of them, some as gifts for other people. When I started blogging, I started storing freebie designs on my laptop along with the links which I keep on a separate page in this blog - Themed Freebie Links. I do try to keep it up-to-date as links do vanish sometimes. If you have any good links to add, please leave a comment. Another favourite free series I collect is the Fairy Day Celebration series from Passione Ricamo. Sadly, I have only stitched one and gave it away. I really need to get these all stitched on various different hand-dyed fabrics. A more recent trend is the freebie SAL which designers have realised is a great way to get people actually stitching the design - peer pressure at it's finest. These are usually found on Facebook groups. 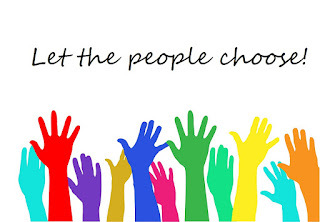 The designer releases a part of the SAL each week or month and everyone gets excited and joins in, encouraging more people to join the Closed Groups thus increasing the designer's following. Great idea, everyone benefits. If you keep up with the SAL. Otherwise you end up with something like this! Started in 2014 and stalled because I didn't like the second block. I will finish this one day. I'm adding one older WIP to my rotation each year so this will have it's hour. One day. Now it's over to you. All you have to do is make a post on the theme of Freebies, mention The People's Choice SAL (you can copy the picture I used at the top of this post and in my side bar) and my blog. Please link up using the URL of the actual blog post, not the home page of your blog. I look forward to seeing what you all post. Great stitched freebies! Thanks for the links. 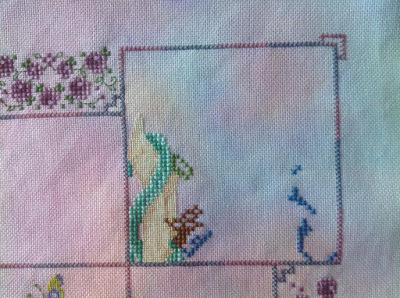 I do like things that go together so series of stitched things are good. Thanks for hosting this! Great minds think alike..I also wrote about copyright . Some lovely freebies you have stitched. what is that you don't like about the second part of the Joan Elliott SAL? Great post. I agree with you about Pinterest. I just don't like it either. It is a lot harder now to find a real freebie. All linked up. Thanks for hosting. Aren't freebies the best thing? So many cute and wonderful patterns! I love what you've stitched and it would be wonderful if more light were shown on European designers. I never really thought about the history of the freebie. My LNS never gave them out and it wasn't until I started blogging that I became aware of so many freebies out there. So many lovely freebie links. Thank you. AriadnefromGreece! Thanks for hosting this Jo. You always do lovely work. I hate it when people steal from designers. Drives me bonkers! I like freebies as well, they are a good opportunity sometimes to process older colors, or older yarns. You can work little things out of it, or big ones. I, too, agree with you about Pinterest. I always appreciate freebies. Oh this month's has been quite the enabling set of posts! At least digital stash doesn't take up any "space" hah. I too dislike Pinterest, enough that I default typing "-pinterest" in all my Google searches whenever I'm looking for an image! And I will never sign up for a blind SAL, free or not. I'm sort of disappointed that FPS does this for almost all of their large patterns anymore. I want to know I'm going to like the design. I hope you figure out what will be way more awesome in the Joan Elliot design so you can march on! I've seen lots of feebies posted by the ladies joining in with this SAL. I have a folder with printed ones that I really should look through and stitch. I am linked up and so excited to hopefully find new freebies. I do look at pinterest, but I look for where the original design is, not easy sometimes! Thanks for sharing what you've got. Mine is posted! Yay, more freebies!! Nice stitching and freebie links Jo. I really like the Lavender & Lace Christmas Angel design. 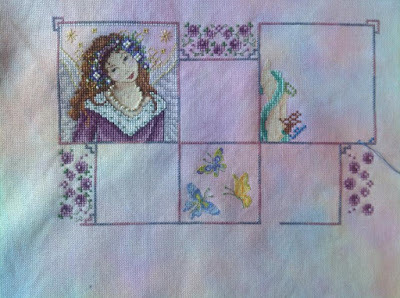 I have just recently followed my first free mystery SAL hardanger design which I knew I would like as I like all the particular designer´s work but how can one choose colours when left up to one to choose and not knowing what the finished piece is like. Love that first one! I tried to link to everything that still existed in my post, it's very photo heavy. :) Cars!! Pretty freebies! I do love those L&L angels and have always wanted to stitch more of them. I did three for my niece's triplet girls years ago, but haven't done one since. Thanks for hosting. These are some great freebies, thanks for the links. I have collected a number of the same ones but I see a few I've never heard of. Just need more time to stitch or faster needles. Pinterest has changed and can be very annoying now trying to find an original post. Aren't all these little Just Nan's your stitching freebies too? I thought I remember you saying so. My March Freebie is posted. Thanks for hosting this SAL, Jo.